We are exceptionally proud to release the outstanding results of our Care Quality Commission (CQC) inspection. The areas for inspection were to ensure that the Charity was Safe, Effective, Caring, Responsible and Well-led. All five areas were highlighted by the inspectors as outstanding with no areas for improvement and we would like to share our success with everyone that helps keep our amazing life-saving service operational. The Charity received two announced visits from the CQC inspectors. Our Earls Colne Airbase was visited on 30th January and our North Weald Airbase, home to our new AgustaWestland 169 was visited on 6th February. The Charity had a second visit to the North Weald Airbase on 13th February. Stuart Elms, Clinical Director said: All the inspectors were incredibly professional and thorough and left no stone unturned in their in their quest to ensure that we were performing to the highest standard within the regulations. 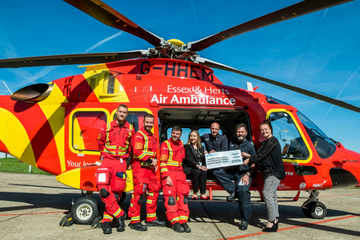 ‘The main service was the provision of urgent and emergency care to critically unwell or injured patients by a team of experienced clinicians who delivered pre-hospital emergency medicine. Patient transportation took place by air or land ambulance, dependent on clinical need. To view the full report please see the link below. To read the full report please visit the CQC website www.cqc.org.uk.